Each 5 oz pudding cup provides 240 calories, 7 grams of protein and 24 vitamins and minerals for a nutritious snack. Great for diets that restrict fluids or require increased calories or protein. 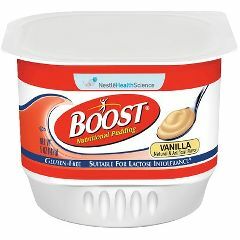 BOOST® PUDDING isn't just good to eat, it's good for fluid-restricted diets, pureed diets, and to help meet increased protein and calorie requirements. Each 5 oz pudding cup provides 240 calories, 7 grams of protein and 24 vitamins and minerals for a nutritionally balanced snack that will add familiarity and texture variety to any diet. Ingredients: Water, Sugar, Maltodextrin, Milk Protein Concentrate, Canola Oil, Modified Cornstarch, High Oleic Sunflower Oil and less than 2% of Corn Oil, Calcium Caseinate, Sodium Caseinate, Potassium Citrate, Magnesium Phosphate, Calcium Phosphate, Salt, Sodium Stearoyl Lactylate, Potassium Chloride, Sodium Ascorbate, Natural and Artificial Flavor, Choline Chloride, Carrageenan, Alpha-Tocopheryl Acetate, Ascorbic Acid, Ferric Pyrophosphate, Zinc Sulfate, Ferrous Sulfate, Niacinamide, Calcium Pantothenate, Manganese Sulfate, Copper Sulfate, Pyridoxine Hydrochloride, Thiamine Hydrochloride, Riboflavin, Beta Carotene, Vitamin A Palmitate, Folic Acid, Chromium Chloride, Vitamin D3, Biotin, Sodium Molybdate, Potassium Iodide, Sodium Selenite, Phytonadione, Vitamin B12. Good Taste. Simple To Take. Produces Results. Supplement to help with nourishment and maintaining weight. Simple To Take. Good Taste. Daily Use. Older People. Adults. IT WAS OKAY, THOUGHT IT COULD HAVE A LITTLE BETTER FLAVOR. I PREFER THE ENSURE CHOCOLATE, BUT BOOST HAS MORE PROTIEN. Do you make a diabetic version? They have the Glucerna nutritional shake line for diabetics but don't think they make a diabetic version for the pudding. How many ounces/milliliters of supplement are in each container? None of the images or text shows that. For others: these supplements usually taste better when well chilled. It's 5 oz / 240 calories I do prefer to have it chilled but it's great tasting either way. That's a good idea. We'll work on getting "sample" or smaller quantities of some of our products like the Boost Pudding. It actually cost the same as the boost nutritional drink for me as far as cost per unit. It is a great tasting pudding - 5 oz / 240 cal and taste better refrigerated. I would like to buy a smaller quantity to see how it tastes. $62 is a lot of money to waste if this taste as bad as the Ensure Pudding I got a the local drugstore. Thanks.